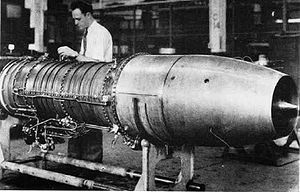 Westinghouse Electric's J30 jet engine, originally known as the J19B, was a simple and robust unit with six-stage compressor, annular combustor, and single-stage turbine. The J30 initially gave 1,200 pounds of thrust, but improved to 1,600 in production versions. The engine's first flight was under a FG Corsair in January of 1944. 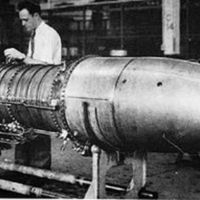 It was developed into the smaller J32 and the Westinghouse J34, an enlarged version which produced 3,000 pounds of thrust. Original black and white newspaper photograph: Naval Aviation News, August 1947: Naval History and Heritage Command, Washington, D.C. Originally published by Naval Aviation News. “Westinghouse J30 Engine.” RICHES of Central Florida accessed April 24, 2019, https://richesmi.cah.ucf.edu/omeka/items/show/7709.